The historic image shows a hotel with wrap-around porch. There are stone steps leading to the entranceway. There is a grass yard with trees surrounding the building. Leaves on the ground suggest a fall season. 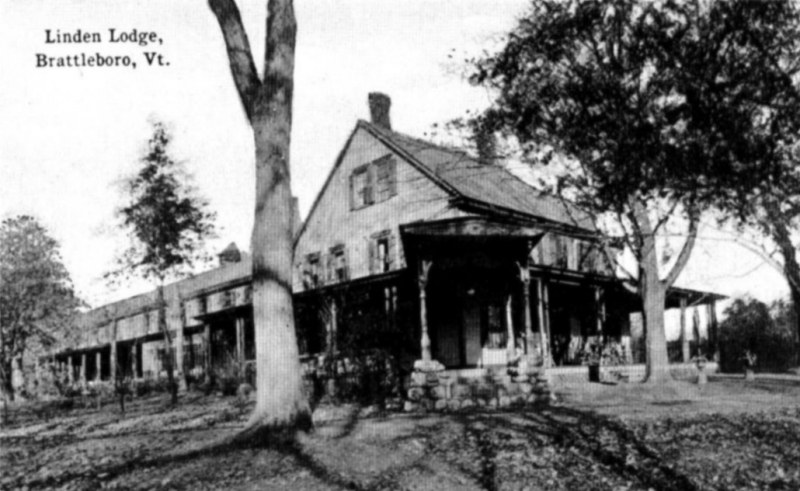 The title at the top of the photograph reads, "Linden Lodge, Brattleboro, Vt." Esther Munroe Swift writes on 2005-1-6: This photo dates from 1900, when the Dr. Shailer E. Laawton and the Directors of the Brattleboro Retreat acquired the cottage as a care facility for mentally ill patients who showed a possibility for recovery. It was so successful that a wing & second story were soon added & later more cottages and amenities were added. This should not be confused with the present-day Linden Lodge on Linden Street, which is a nursing home.